Published by Patumwan December 29th, 2007	in Editorial, Events and Painters. Yesterday evening I was at a VIP party at in Sunrise, Florida, for the unveiling of the new creation of artist . As you know now, David is the unchallenged Master at rendering in paint the old days of motorcycling. Every couple of years he creates a new masterpiece featuring a woman and "Evelyn" follows "Ruth" released 2 years ago. I saw Evelyn up close and it was love at 1st sight. When I post about David Uhl I always feel bad about not being able to demonstrate with a small picture in low resolution the quality and finesse of his work. But David travels a lot to rallies and motorcycle events.So,if you get a chance, stop by and visit his display ( always located near or inside the local HD dealer because he is an official licensed Harley-Davidson artist). (Picture David, Cyril, Bruce Front Of "Evelyn"). 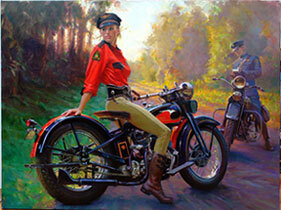 Saw the work of David Uhl during Daytona Bike Week. His paintings must be seen in person. Beautiful lights and details. His work is all about the beauty and romance of riding. Even in the small size and resolution it makes you want to see it in it’s original form. Do you know if it will be on display during Daytona Bike Week? 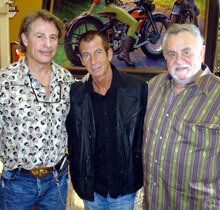 Yes, David Uhl will be in Daytona with Evelyn. A lot of emotion, nostalgia and romance in this painting even when published in small size. Will Uhl make prints? How much? David Uhl is to me the best there is. He makes the motor-scene in his own special way (romantic style)acceptable for every-one. Great artist ! another Uhl masterpeice, he captures light so perfect!